Cigar Box Guitars, or CBGs, have been made in the U.S. since at least the late 1800s. People without enough money for “proper instruments” have historically made CBGs from cigar boxes, along with other make shift materials that could be found or purchased inexpensively? The calculations for placement of frets on a CBG are based on a mathematical formula based on dividing by 17.187, the mathematical constant for equal temperament of tones in western music. On line fret calculation programs that allow you to enter your design specifications work for CBGs. Some of these are free to access. Measure the scale length of your CBG. Scale length is the distance between the bridge and nut of a stringed musical instrument. Divide your scale length by 17.817. The answer is your first fret’s offset from the nut. The nut is the piece, just under the headstock, that keeps your strings up and off the fret-board. The bridge serves this function at the back of the CBG’s body. All frets are calculated in distance from the nut. For example, if your CBG’s scale length is 24.5 inches, which is common for a CBG, divide 24.5 by 17.817 to get 1.375. It’s pointless to calculate beyond three decimal places since you are not able to cut the frets any more accurately, nor are you able to hear difference in tone beyond that tolerance. 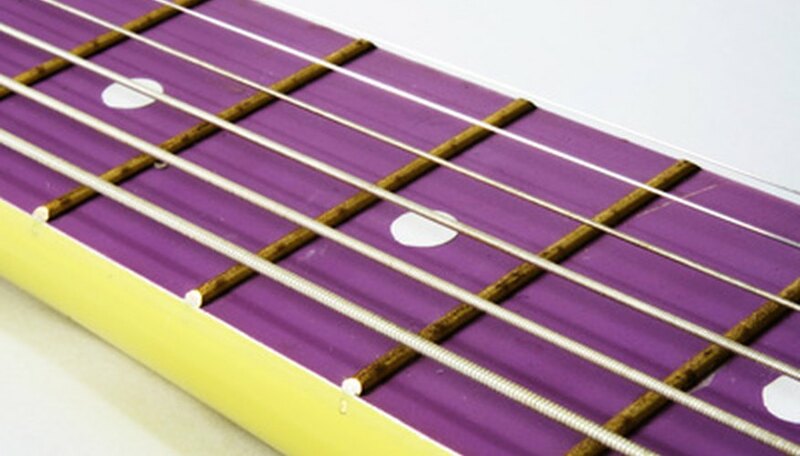 Position your first fret at 1.375-inches from the nut. Subtract the distance between the nut and the first fret from your scale length and divide that number by the constant, 17.817. Add this result to the distance between the nut and the first fret. The answer is the second fret’s offset from the nut. For example, subtract 1.375, your first fret’s offset from the nut, from 24.5, your scale length, to get 23.125. Divide 23.125 by 17.817, yielding 1.297. Add 1.297 to 1.375, your first fret’s offset from the nut, to get 2.672. Position your second fret 2.672 inches from the nut. Subtract the distance between the nut and the second fret from your scale length and divide that number by the constant, 17.817. Add this result to the distance between the nut and the second fret. The answer is the third fret’s offset from the nut. For example, subtract 2.672, your second fret’s offset from the nut, from 24.5, your scale length, to get 21.828. Divide 21.828 by 17.817, yielding 1.225. Add 1.225 to 2.672, your second fret’s offset from the nut, to get 3.897. Position your third fret 3.897 inches from the nut. Continue using the same series of formulae for each fret up the neck. You can find free-use, online fret position calculators, good for CBGs, at the Cigar Box Guitars website and the Liutaio Mottola Lutherie Information website. How Do I Calculate Where To Place the Bridge on My Guitar?